While radicals have been widely implicated in many toxicities, the chemical details of the mechanisms associated with these toxicities are less well defined. This is complicated in part by the fact that many radical forming drugs also generate electrophiles, and due to the difficulty in studying radicals in general. Radicals contain one or more unpaired electrons, and may participate in nucleophilc or electrophilic type reactions, but these are mechanistically distinct from the electrophilic processes discussed above. Reactivity can be markedly influenced by orbital symmetry, which in turn is effected by substituents (Mile 2000). The reactions of relevance to biological systems involve: 1. Direct reaction with cellular constituents to form a covalent adduct (and a resulting more stable radical). 2. Hydrogen radical abstraction to form a radical based on an endogenous cellular constituent or 3. Direct reaction with a second unpaired electron species, most importantly, molecular oxygen, generating reactive oxygen species and oxidative stress. 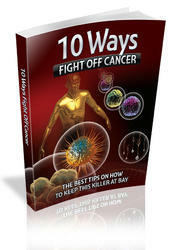 It is likely that this last process has the most important toxicological consequences. It should be noted that the first two processes result in the formation of new radicals which potentially could also react with oxygen, and it is perhaps for this reason that the literature frequently does not address this level of mechanistic detail when oxidative stress is observed. Some of these points, together with a discussion of pathologies believed to be associated with radical formation, have been recently reviewed (Sorg 2004). 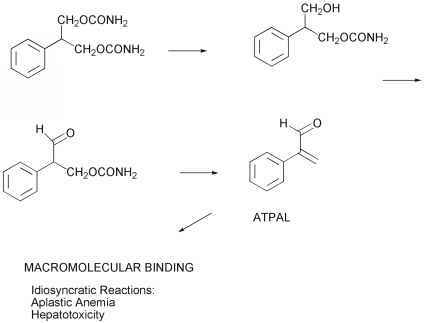 Examples of free radicals directly forming covalent adducts with biological molecules include certain compounds noted as mechanism based inhibitors of CYP (Ortiz De Montellano 1990). Thus the free radical formed during oxidation reacts with the heme group to form a covalent bonds. The particular functionalities capable of this type of mechanism based inhibition is in part a reflection the combination of their capacity for one electron oxidation chemistry mediated by CYP, and the highly delocalized nature of the heme prosthetic group, where a more stable radical localized on the heme can be formed, (although a number of different reactions are possible). Functionalities which can cause mechanism based inactivation of CYP by this mechanism include halocarbons, hydrazines, olefins, sydnones, cylopropylamines, and some dihydropyridines and dihydro-quinolines. The cyclopropylamine group is encountered in a number of drugs, and may be bioactivated to form a distonic radical cation as shown in Figure 22. The direct relevance of cyclop ropy lamines oxidation to toxicity seems to be predominantly associated with a higher risk for drug interactions, since to date there seems to be little evidence that this property is the causative event for other forms of toxicity, idiosyncratic or otherwise. Distonic Radical Cation Figure 22. The oxidative metabolism of cyclopropylamines to distonic radical cations. Figure 23. 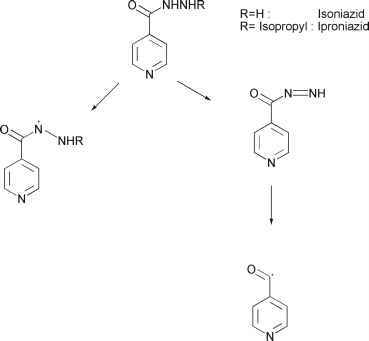 Proposed radicals produced by metabolic oxidation of Isoniazid and Iproniazid. proposed as biological consequences (Albano and Tomassi 1987). Isoniazid acetyl radicals also appear to form covalent adducts with NAD(H), (Nguyen et al. 2001). Figure 24. 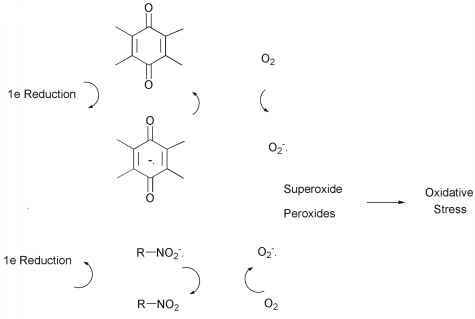 Redox cycling by one electron oxidation of quinones and nitro aromatics, to produce reduced, active oxygen species. Figure 25. 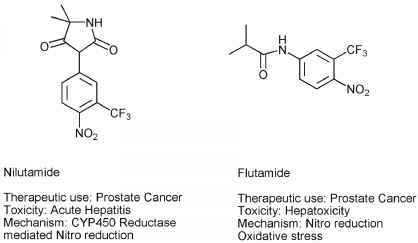 The structures of Nilutamide and Flutamide. amount of drug (Figure 24). From a drug development standpoint however, this is mitigated by the fact that a rather limited number of functionalities so far have been noted that are capable of redox cycling by this mechanism: quinones, nitroaromatics, some quaternary ammonium compounds and transition metal complexes. Quinone redox cycling has been most extensively studied with the anthraquinone antineoplastic agents such as Doxorubicin. Long term use of Doxorubicin is associated with cardiomyopathy due to mitochondrial toxicity, and despite continued investigations, reversible quinone reduction leading to oxidative stress remains the most likely mechanism (Wallace 2003). The reduction of aromatic nitro compounds may lead to nitrogen centered electrophiles as discussed above, but the initial one electron reduction product is the nitroradical anion which may undergo redox cycling. The antiandrogen Nilutamide is used to treat prostate cancer, is hepatotoxic, and to a lesser extent also a pulmonary toxin. This appears to be due to redox cycling (Fau et al. 1992), but the free radical can also undergo further reduction to nitroso and hydroxylamine intermediates (Berson et al. 1994). Flutamide is another nitro aromatic antiandrogen associated with hepatotoxicty, and redox cycling via nitro reduction is implicated (Nunez-Vergara et al. 2001). The structures of these drugs are shown in Figure 25. Reactive intermediates may be grouped according to their reactivity patterns, and reactive metabolites with similar reaction properties may derive from quite different functional groups. Reactive metabolites may be broadly classified as either electrophiles or radicals. At present, electrophiles constitute the more important group due to the wide diversity of structures that can produce these, and are hence more likely to be encountered in drug development. However, as more work focuses on searching for radical intermediates, their implication in toxicity mechanisms is likely to increase. In all but a few cases, proposed reactive metabolites have not been proven to be the cause of the toxicities to which they are associated, and in many cases a particular compound, or even a particular functional group, is capable of forming more than one type of reactive metabolite. This makes application of this type of information to drug development problematical. Never the less, approaches have been proposed by which this type of information might be applied to minimize safety risk in drug development (Evans et al. 2004). The emphasis on bioactivation or covalent binding frequently remains a point of contention in selecting candidates for drug development. Bioactivation must be put in context with other properties of the compound, (most particularly anticipated dose level), to gauge the level of concern, and in the future is more likely to find value in combination with other types of data. The use of genomic and proteomic information to gauge safety risk in preclinical toxicology will increase significantly in coming years (Cohen 2004, Lord 2004, Selkirk and Tennat 2003, Walgren and Thompson 2004). Thus if changes in the expression of genes associated with the processing of electrophilic metabolites or oxidative stress are observed, knowing if such mechanisms are operating for a particular compound will help significantly in interpreting these findings. Also, if such properties are identified in a lead candidate, it is only by an understanding of the underlying chemistry behind them that such properties can be rationally designed out of follow up compounds. While risk can potentially be minimized by these approaches, managing the consequences of idiosyncratic toxicities will remain a clinical issue for the foreseeable future. Here, genomics may also have significant potential. The feasibility of identifying genetic risk factors for individuals towards a particular idiosyncratic reaction has now been demonstrated (Martin et al. 2004), and if this approach is found to be general, may have significant impact in managing these important metabolically mediated toxicities. Bonierbale E, Valadon P, Pons C, Desfosses B, and Dansette PM. Opposite Behaviors of Reactive Metabolites of Tienilic acid and It's Isomer Towards Liver Proteins; Use of specific Anti-Tienilic Acid -Protein Adduct Antibodies and the Possible Relationship with different Hepatotoxic Effects of the Two Compounds. Cooper AJL, Bruschi SA, and Anders MW. Toxic Halogenated Cysteine S-conjugates and Targeting of Mitochondrial Enzymes of Energy Metabolism. Hanzlik RP, Vyas KP, and Traiger GJ. Substituent Effects on the Hepatotoxicity of Thiobenzamide Derivatives in the Rat. Toxicol and Appl Pharmacol 1978; 46(3): 685-94. Maggs JL and Park BK. Drug Protein Conjugates XVI. Studies of Sorbinil Metabolism: Formation of 2-Hydroxysorbinil and Unstable Protein Conjugates. Olson H, Betton G, Robinson D, Thomas K, Monro Akolaja G, Lilly P, Sanders J, Sipes G, Bracken W, Dorato M, Van Deun K, Smith P, Berger B, and Heller A. Concordance of the Toxicity of Pharmaceuticals in Humans and Animals. Soriani M, Pietraforte D, Minetti M. Antioxidant Potential of Anaerobic Human Plasma: Role of Serum Albumin and Thiols as Scavengers of Carbon Radicals. Ward F, and Daly M. Hepatic Disorders. In: Lee A. Adverse Drug Reactions Pharmaceuticl Press 2001: 77-97.